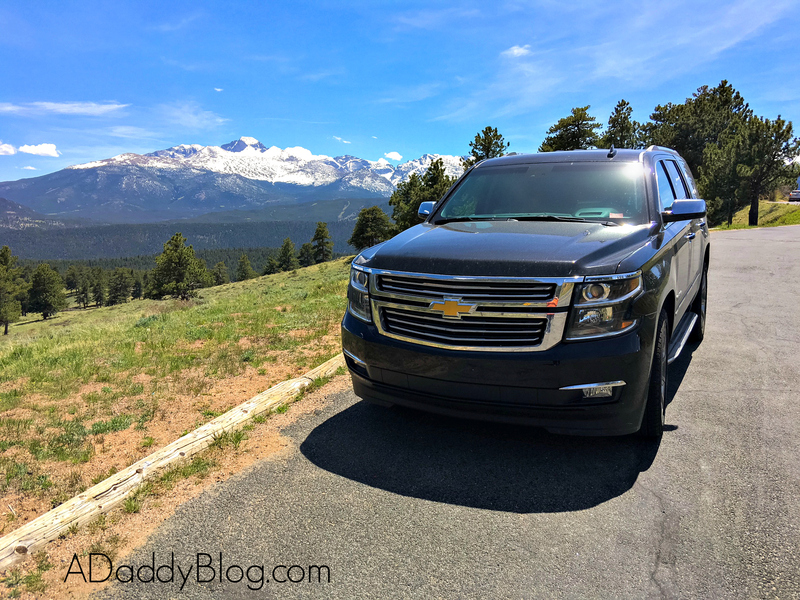 Our 2016 Chevy Tahoe LTZ Estes Park Colorado Road Trip! 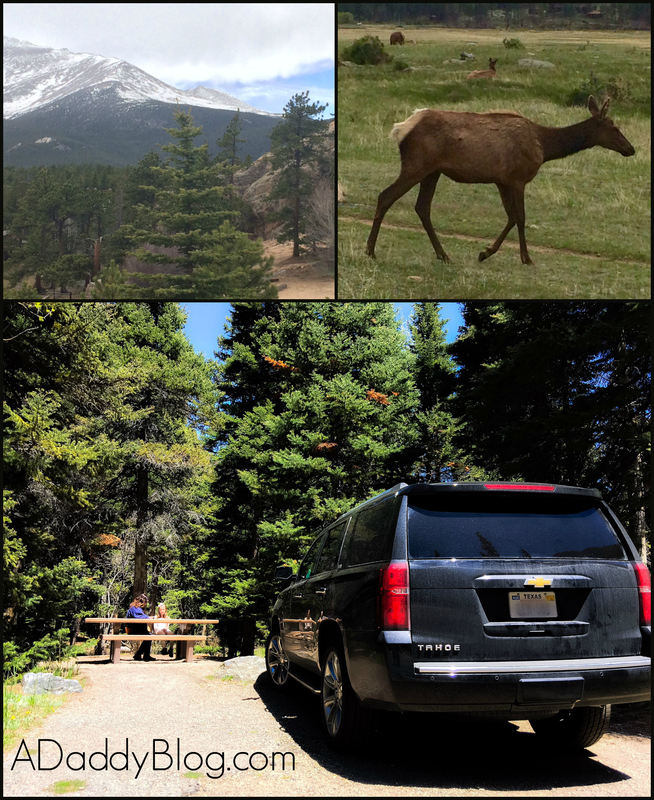 When our family decided to visit Rocky Mountain National Park this summer, we immediately started discussing whether or not to fly or drive to Colorado from our home state of Texas. I’ve you been following me for a while you know I’ve been dreaming all winter about taking a road-trip like my family did every summer when I was a kid. I really wanted to make the journey a two day road trip, but my family wondered if we could be comfortable driving for such a long trip. We needed a vehicle that was safe, comfortable, had lots of entertainment features, and was an enjoyable driving experience. So when the kind people at Chevy offered to let us try out one of their roomiest vehicles, we jumped at the chance. The 2016 Chevy Tahoe LTZ ended up being the perfect choice for us, because it checked all the boxes on our wish list – and even had features we didn’t know we wanted until we experienced them! One of the highlights of our Road Trip was a day spent driving over the continental divide on Trail Ridge Road in Rocky Mountain National Park. Trail Ridge Road is one of ten America’s Byways in Colorado and a national designated All American Road! And it’s an extreme drive! Trail Ridge Road travelers climb some 4,000 feet in a matter of minutes, and is only open a few months out of the year due to the harsh Arctic tundra conditions. Our Chevy Tahoe handled the elevation with ease, and kept everyone in the cabin in complete comfort! Apple CarPlay Capability! I created a playlist on my iPhone of epic movie themes to act as the soundtrack for our drive through these majestic mountains. With the familiar icons we could also stream Pandora & Spotify, and control many more apps straight from the integrated touch screen. Enhanced Driver Alert Package featuring power-adjustable pedals, forward collision Alert, IntelliBeam headlamps, Lane Keep Assist and Safety Alert Seat! This was really awesome. While I cannot recommend you take your hands from the wheel I tested the lane assist by letting the Tahoe begin to drift out of its lane on a curve, and it actually steered the car back in place. Available Head-up display w/multi function readouts and reconfiguration Instrument cluster. I love being able to view key features, including of course your speed, on the heads-up display (projected on the windscreen) so I could keep my eyes safely on the road. Standard 8-inch-diagnol color touch, connected radio with Onstar 4G LTE standard Wi-Fi! Okay, the 4G LTE Wi-Fi was something I just LOVED. 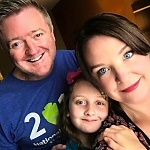 You can connect up to 7 devices, so our daughter could use her iPad in the back seat, while my wife stayed connected to social media, and I linked up my iPhone and streamed content without using up any data on my cellular plan. It was beyond awesome! 94.7 cu.-ft. – Honestly I don’t know how we’d have made the trip in a lesser vehicle. We’d have had to leave a lot of things home, even if we had a roof-top rack. We packed anything we wanted and had room to spare. We also really appreciated being able to fold the second and third row seats up and down with the push of a button to fit our luggage perfectly while still retaining lots of room for mommy, daddy and car-seat for the kiddo! Fold-flat second- and third-row seats that add cargo convenience, including power folding! Keyless entry. I loved power opener on the cavernous back gate with the push of a button. Available eight-inch color touchscreen radio w/ next-generation MyLink Connectivity. Up to SIX USB ports and SIX power outlets! And yes, we used all of them. Aerodynamics that enhance and contribute to a quieter ride! Chevy had clearly put a lot of work into this, with acoustic-laminated windshield and triple-sealed inlaid doors to help reduce outside noise. Hidden conversation mirror in the overhead console that shows panoramic view of the rear seats. Great for seeing what those little rapscallions are up to in the back two rows! I was so grateful that we chose to drive a 2016 Chevy Tahoe on our two week road trip. 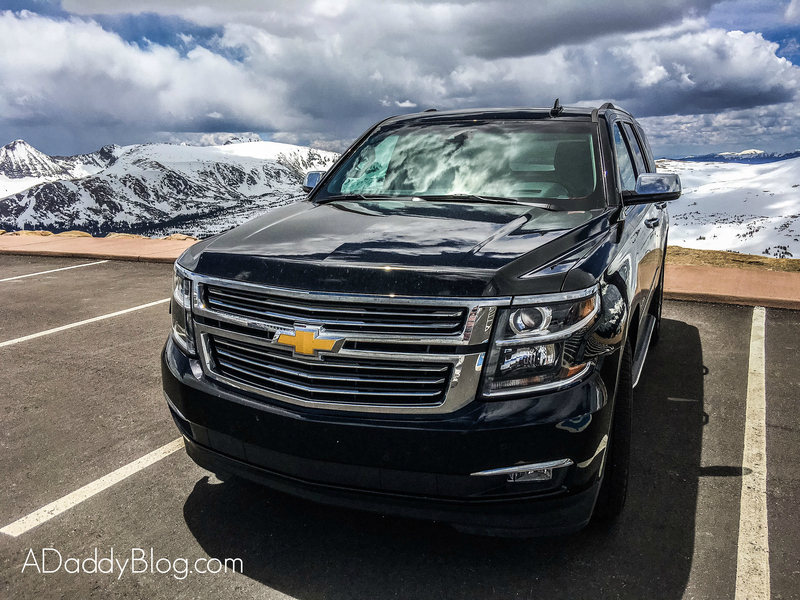 I’ll be sharing more about our Colorado Road Trip in the coming month, as well as some additional things we loved about the Chevy Tahoe. Our family recommends this vehicle for families that like to traverse the road less traveled, as well as families that just want a great ride around town! We were endlessly impressed by how comfortable the Chevy Tahoe kept us as well as all the safety and entertainment features that kept our hours in the vehicle full of fun. Many thanks to Chevy for giving us the chance to try out the Chevy Tahoo! We give it two thumbs up! All opinions are my own, and were not influenced.